RAMANRXN1™ Microprobe combines a RAMANRXN1™ R&D-capable instrument with an optical microscope to provide distinct advantages over traditional Raman microscopes. This compact system includes Kaiser's award-winning ƒ/1.8 axial transmissive imaging spectrograph, Kaiser-developed lasers, and our HoloPlex™ transmission grating technology. 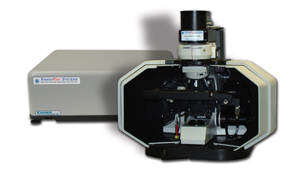 The HoloPlex™ advantage allows the entire Raman spectrum to be collected simultaneously at high resolution by optically folding the scattered Raman photons onto a large-format multi-channel CCD detector. Qualitative analysis is faster compared to traditional scanning instruments because all the wavelengths are measured simultaneously. Fiber optic coupling provides real experimental versatility and stability and allows for future system upgrade. Simply switch fiber optic cables to go between the microprobe and a remote sampling setup without instrument realignment. An optional calibration accessory provides analytical robustness during method development and instrument documentation for regulatory purposes. (width × length × height) 26" × 25" × 25"